We bet it is on your wish list to teach your little one how to ride a bike when s/he is old enough because hey, that's how and where we came from ourselves, right? But do you remember the exhilaration (or let's be more honest, the fear) you felt when your mom or dad let go of their hand from the banana seat after steering you a good block away? Yep, we remember feeling terrified! The good news is, there is a new tool nowadays that helps out the process - the balance bike. 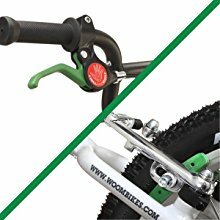 A balance bike looks exactly like a two-wheeler bicycle, except for one difference - a balance bike does not have pedals and training wheels. How it works is that your toddler will first walk while s/he sits over the saddle. Once they get familiarize with it, they will start to scoot around and before you know it, they will be gliding and running in it with both feet lifted off the ground. And this is all without your guidance/assistance! So why or how exactly does this help with children learning to ride the two-wheeler bicycle? Well, they intuitively develop the skill of balancing while steering on the balance bike, most of all, it helps builds up their coordination, confidence and independence so that they won't feel as terrified when faced with the real thing - the pedal bike. Since the bike has no pedals or other complicated forms of propulsion, children will find riding a balance bike as easy as walking. At least, there won't be the element of fear because they can place their feet solidly on the ground whenever need be. As we know, courage plays a big part in learning how to ride a bicycle so training them from early with a balance bike will definitely help in mastering the skill faster at the later stage. 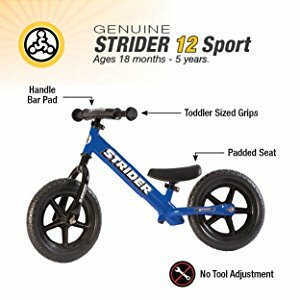 The Strider 12 Sport Balance Bike is the best kids balance bike to have if you wish to start them young. By means of young, we mean starting from 18 months - yep, this balance bike can totally cater to that thanks to its many developed enhanced features, including having the lowest seat in the industry. This, together with the handlebar and extra-long seat post, are all height-adjustable thus making it possible to accommodate ages 18 months to 5 years, or a 12 to 20" inseam (no tools required). The reason we like the Sport better than its Classic version (another hugely popular choice) is because with just an extra $20 more, you get so many other features and longer use than the latter (the Classic can only cater up to 3 years of age) without losing well-loved features like the lightweight and durable frame (6.7 pounds) and puncture-proof tires. To name a few, the Sport has a padded saddle, toddler sized custom grips, handlebar pad and a no-tool adjustment feature - all meant for the extra comfort of your child and yourself! Further, the Sport is capable for future upgrades such as a foot brake or heavy-duty tires. 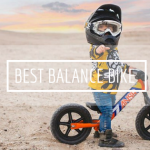 Coming from a company that specializes specifically in balance bikes through ten years of development and manufacturing improvements, you can rest assured your little one is in good hands developing two-wheeled balance, coordination and confidence. 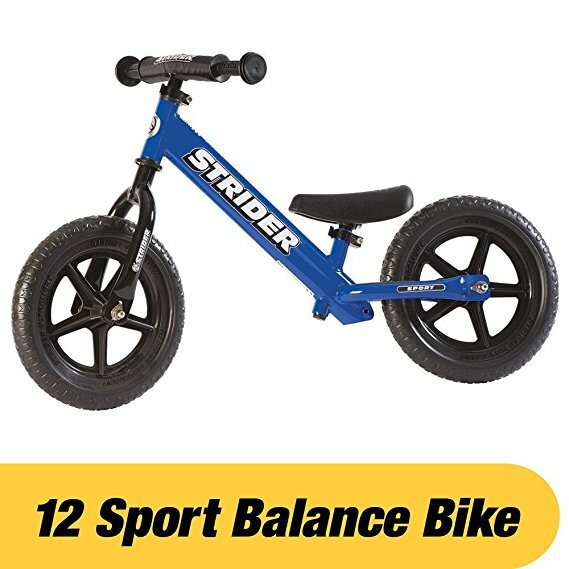 With more than eight years of design evolution coming altogether in one model, the Strider 12 Sport Balance Bike is the best balance for 5 year old and lower, not to mention being the best price strider balance bike in our opinion. 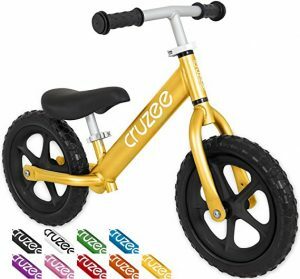 Coming close in second as best balance bike for 18 month old and beyond is the Cruzee UltraLite Balance Bike, available in 20 different colours. Like the Strider, this balance bike is a worthy long term investment to make because it is designed with a wide seat and handlebar adjustment to grow with your child up to 5 years old. Incredibly comfortable with soft grips, a super comfy seat, low-profile axle bolts & flat-free foam rubber tires, your child can learn the basics of balancing by planting his feet safely on the integrated footrests. 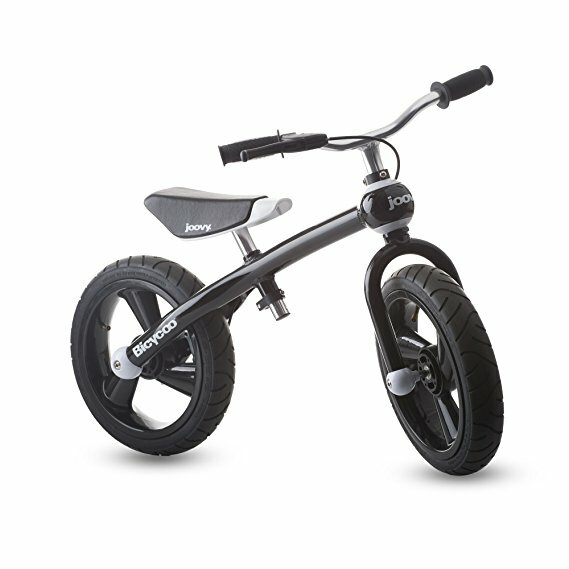 Not only is it easy to maintain thanks to the rust-free anodized aluminium it is constructed with, it is also super lightweight at 4.4 pounds only - the lightest balance bike in the world! 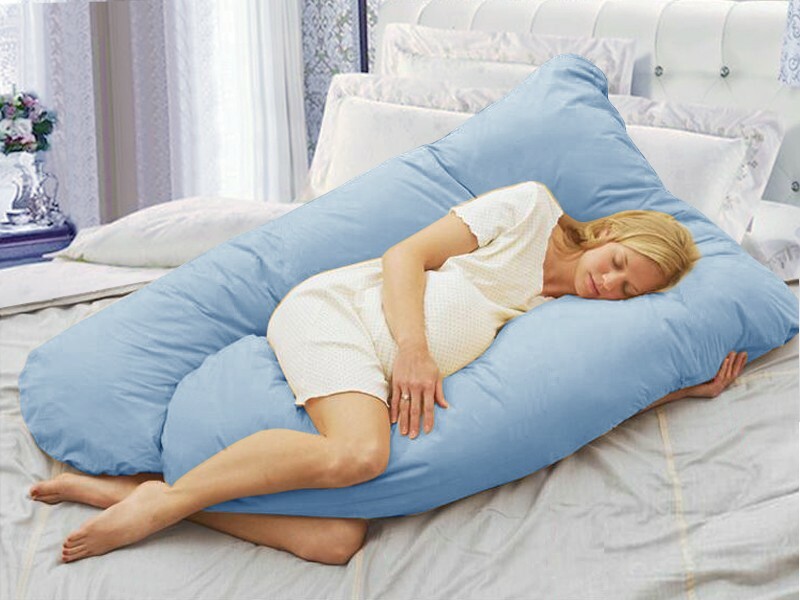 Even your little one can lift it up himself, it is a breeze to carry around anywhere you go. The Cruzee UltraLite Balance Bike is slightly more expensive than the Strider but it comes with a lifetime warranty and money back guarantee which goes to show how confident the company has in its product. We think it best suits children who are smaller in size because ideally, a bike should not be more than 15% of a child's weight. 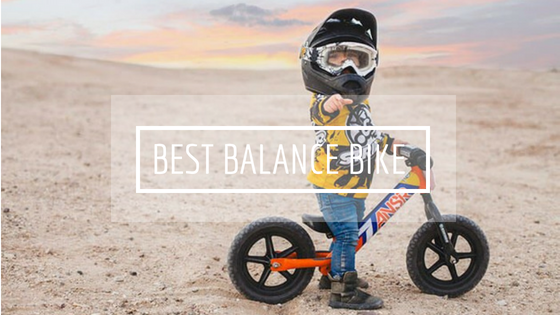 We therefore think it is the best balance bike for 3 year old or below, which is the best age for balance bike anyway for children to build up their confidence and independence before taking on the traditional bike at a later stage. The Woom 1 Balance Bike is another best rated balance bike that we'd like to review for you. 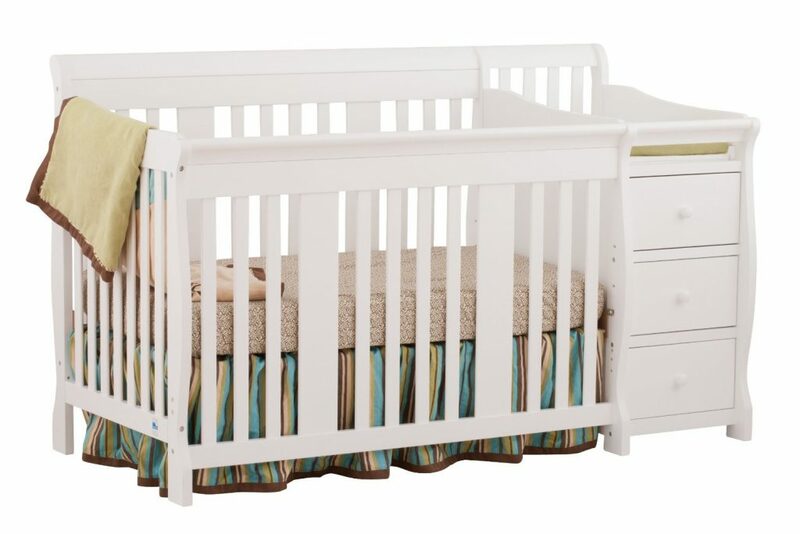 Featuring an extremely low minimum seat height, it makes it ideal to start your kid on it as young as 18 months old. Different than the other bikes reviewed above though, is that this one here only lasts till your child turns 3.5 years old, or 39" height, and has quality air-filled tires as opposed to flat-free ones. If not for the convenience of airless tires, pneumatic tyres like this one is actually much better because they roll so much smoother which your child will enjoy more in the long run. One thing we like about the Woom 1 is that it teaches the most essential element - safety from the very early stage by incorporating a rear-hand break feature, designed to fit the smallest of hands, in its design. Learning to use the break at an early age will ease the transition to a pedal bike and will reduce the risk of accidents in the future. Other safety features include a steering limiter to prevent oversteering of the handlebar, thereby promotes straight-riding and limits swerving which is of particular importance for the beginners. The long wheel base adds to its safety and stability and is optimized for an upright riding position while the lightweight aluminium frame makes it easy to be ported around. 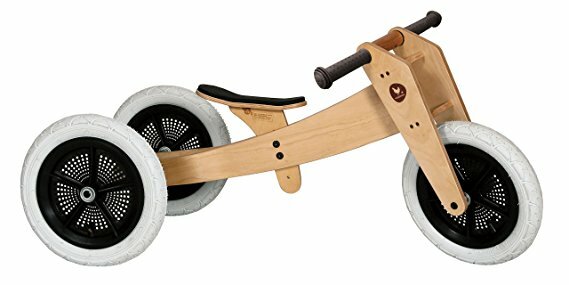 Geometrically designed with an extremely low step-through entry point and a high cockpit, the Woom 1 Balance Bike is easy to assemble with all tools provided and guided instructions. We note it is more expensive than the others, but you are looking at a very high quality product here that will last you a long time. 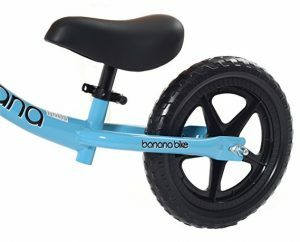 Parents who have bought it certainly have no regrets, saying it is the best balance bike that's worth every penny paid. 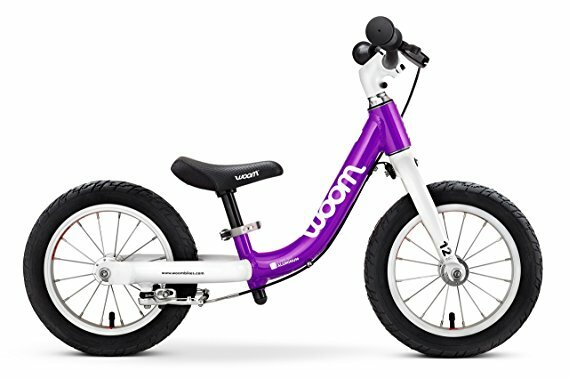 If you like the idea of pneumatic tyres but find the Woom 1 pricing a tad too expensive, the Joovy Bicycoo Balance Bike is a great alternative to consider. In fact, this balance bike is well loved by many parents, not just for its more affordable price tag but because of its overall quality and functionability. 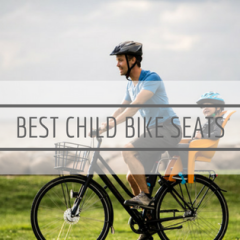 It has won designs awards at Europe's largest cycling trade show, so that is saying something - there is nothing to worry about in terms of your child's safety and wellbeing on it. The frame is made of super strong yet lightweight aluminium, which makes it easier to control and manoeuvre than heavier options like steel. 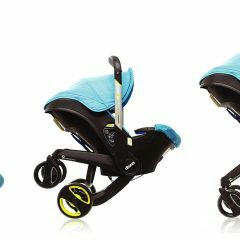 As mentioned above, the tyres are pneumatic and refillable which give them better suspension qualities and this in turn provides for a much smoother ride for your little one. This is something EVA plastic tires, which is what's used predominantly in the industry, cannot provide. Further, they do not wear out as quickly as these rubber tires so even though they do not have the non-flat convenience, they do sustain better for you to get much longer use. And it definitely helps in the balancing and stability department for having 2.5" tyres, which is wider than most in the market. To enforce the safety department, the Bicycoo also incorporates a rear hand brake with the brake cable internally routed through the frame so your little one can start practising using the brakes early. 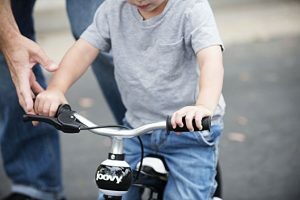 With a height adjustable seat, the Joovy Bicycoo Balance Bike is suitable for children 18 months and up to 55 pounds - many say it makes for the best balance bike for 2 year old because kids at that age are generally of the optimum size for a best fit of the bike. 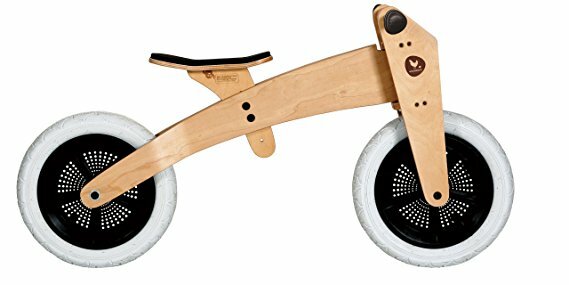 For those that are eco-conscious, you may wish to get the best wooden balance bike - the Wishbone 3 in 1 Original Balance Bike that is made of sustainably-harvested birch and eucalyptus wood, even the drawstring tool bag is made of organic canvas! Named a TIME Magazine Top 100 Green Design, every Wishbone Bike has 60% post-consumer recycled plastic wheels and is bonded and finished with quality products, using absolutely non-toxic glues and finishes. This includes the Bike box and all printed material inside, all of which are recycled and printed with non-toxic inks. Enough with its eco-sustainability, let's talk about its function. This multi award-winning balance bike is called a 3 in 1 for a reason - starting at age 1 as a trike, it converts to a running bike as your child grows and by four to five years old, the wishbone frame can be flipped to become one of the largest running bikes on the market. In short, the Wishbone Bike can be transformed from a baby walker and push tricycle to a small balance bike before becoming a large balance bike eventually thanks to its brilliant design. So compare to other balance bikes, this one here teaches your baby to walk! 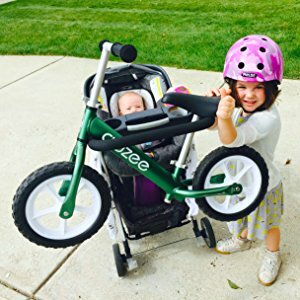 Since it is made of wood, it is slightly heavier than other balance bikes but that also means it is stabler for crawlers to hold on to when they are ready to start walk-learning, which is why babies as young as 12 months can start using it. Not to mention, the air-filled rubber tyres make for a smoother and longer ride, too. With so many awards tucked under its belt (Dutch Best Baby Toy, JPMA Innovation Award, Dr. Toy Best Green Toy etc. ), the Wishbone 3 in 1 Original Balance Bike is truly one best balance bike for 4 year old and below that has exceeded European, US and Australian toy safety standards. It is the smallest AND largest balance bikes, all in one package on the market that is of the highest quality function, design and eco credentials. 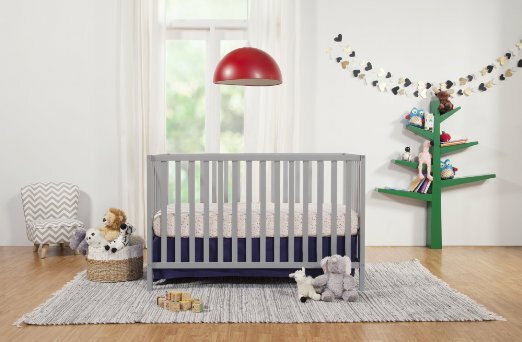 We know not everyone has the budget, which is why we have found cheaper (under $100) but equally wonderful alternatives to the above if you do not wish to be spending too much on this little toy for your little one. 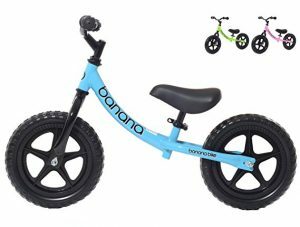 The Banana Bike LT - Lightweight Balance Bike is one good choice for those that like the standard balance bike without the hefty price tag. This newly improved model has an updated design with upgraded bearings, upgraded seat, new quick release seat bracket, new stronger metal headset and new upgraded handlebars all meant for the better comfort of your little one. And it is now easier to assemble than its previous models! 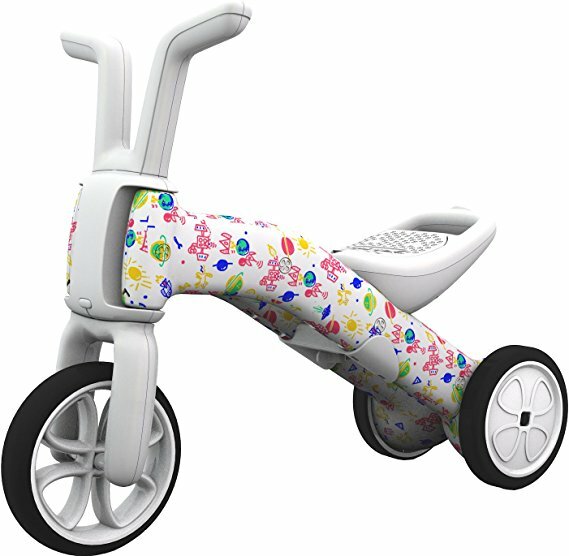 With an adjustable saddle that starts as low as 12.2 inches, its banana-shaped bicycle frame design is ideal for 18 month old toddlers to 4 year olds. Despite being under $100, the Banana Bike LT is made strong and durable, yet light enough for maximum fun and easy to carry. Toddlers can easily handle the bike, even lifting it themselves, and the puncture proof EVA foam tyres give you the convenience of never needing to inflate them ever. Parents have vouched for the safety of the Banana Bike LT - Lightweight Balance Bike, saying that even if your little one tipped while being on it, the lightweight frame will not hurt him/her if it falls on your child. In terms of the best value balance bike on the market, we think this one here will surely not disappoint you as the tool to start your child on their biking journey. If price is a major factor in your consideration, then you will love the Chicco Red Bullet Balance Training Bike - check out its price here. 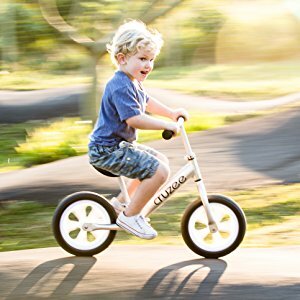 Featuring everything a balance bike should have, the Chicco Bullet Balance is lightweight and sturdy for your little one to manoeuvre around. The seat, though height adjustable, is not able to cater for children below 3 years old so this is a hindrance to take note of if you wish to start training your little one earlier. Other features such as puncture-resistant tires, rubber handlebar grips and padded seating are all included to ensure children have an easy, smooth and comfortable ride on it. And weighing less than 6 pounds, it is also one of the lightest balance bike available in the market, making it easy for you (or your little one!) to carry around. The Chicco Red Bullet Balance Training Bike is a straight-forward, no fuss balance bike that is price-friendly for families with a budget - it may not necessarily be the best balance bike for 1 year old, though you can certainly try to see if your little one's feet can touch the ground having adjusted the seat to the lowest possible. Nonetheless, it definitely is one of the best balance bike for toddlers 2-3 years old onwards to learn faster without the challenge of pedals, brakes or training wheels. 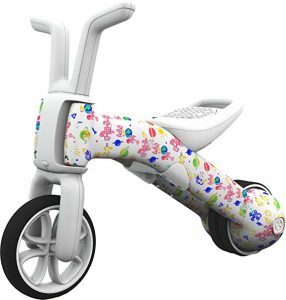 If you like the Wishbone 3 in 1 but the price is a lil steep for you, a good alternative is this Chillafish Bunzi Fad Edition 2 in 1 Gradual Balance Bike that is designed for ages 1 to 3 or maximum 55lbs. 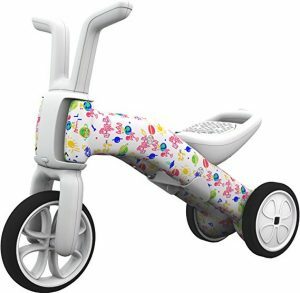 Designed with cute bunny-style handle bars, this balance bike has an intuitive form that grows with your children, including the size of the seat from 22cm in 3-wheel mode to 25cm in 2-wheel mode. We like how it has silent, anti-skid non-marking synthetic rubber tires, which means it doesn't produce those annoying skidding noise, that can be use both indoor and outdoor. This bike can be switched between 3-wheel mode and 2-wheel mode (pictured left) in just a few seconds, without tools. 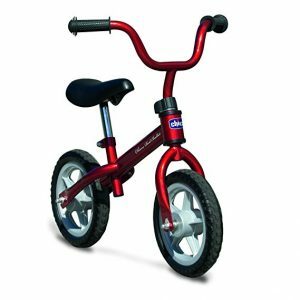 This way, your child can start on it early and when s/he is ready, you can then switch it to 2-wheel mode to further train his balance and coordination skills. Uniquely designed to help teach your child balance at their own pace in a fun way, the Chillafish 2 in 1 Gradual Balance Bike is made of high-quality ABS material and is easy to carry around thanks to the seat handgrip. And a little different from the rest - it has a hidden storage box in the seat so your child can bring along a toy or snacks for the ride, just like the adult's motorcycle! The good news is, there is a new tool nowadays that helps out the process - the balance bike. Compare different brands and find the best deals this Black Friday and Cyber Monday Grand Sale. Don't miss out! DON'T MISS THIS AMAZING BLACK FRIDAY DEAL FOR THIS BESTSELLER!